You will never have to worry about caring for your succulents again with this artificial succulent garden handcrafted by House of Silk Flowers. 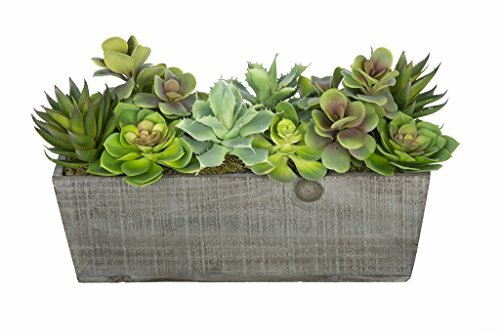 This arrangement features an assortment of succulents "potted" in a rustic grey-washed wood planter (16" x 6" x 5 1/2" tall). The succulents have been arranged for 360*-viewing. The overall dimensions are measured leaf tip to leaf tip, from the bottom of the planter to the tallest leaf tip: 18" wide X 9" deep X 10" tall. Measurements are approximate, and will be determined by your final shaping of the plant upon unpacking it. No arranging is necessary, only minor shaping, with the way in which we package and ship our products. This product is only recommended for indoor use.